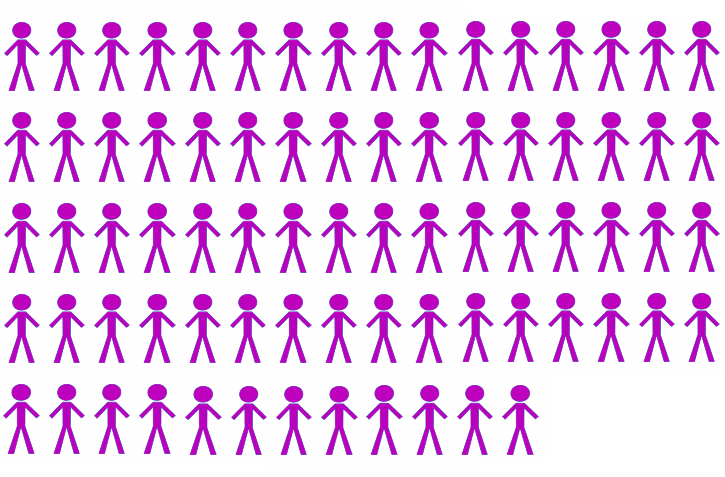 An estimated 1 in 9 Australians have asthma, which is approximately 2.5 million people, based on self-report (AIHW 2017 Snapshot). 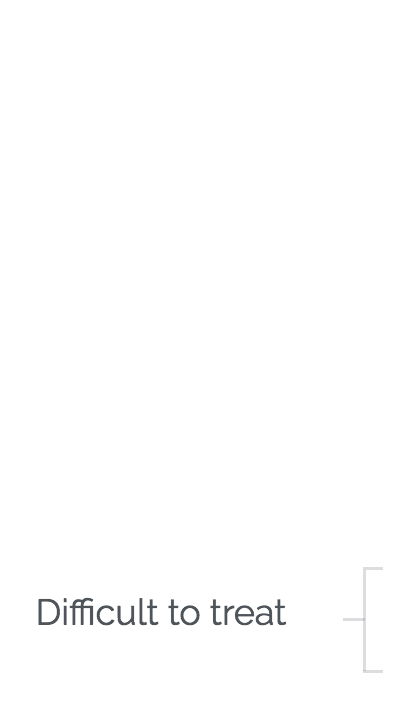 This is high by international standards. An estimated 300 million people have asthma worldwide. Indigenous Australians are nearly twice as likely to report having asthma, compared to non-Indigenous populations (AIHW 2017 Snapshot). Between 3% (Hekking et al. 2015) and 10% (Chung et al. 2014) of all individuals with asthma are thought to have severe disease, based on international estimates. The number of individuals in Australia with severe asthma, including in the Indigenous population, is not known. However, several studies have shown that only 17%-60% of people with asthma have good preventer adherence, and only 10%-23% had correct inhaler technique. 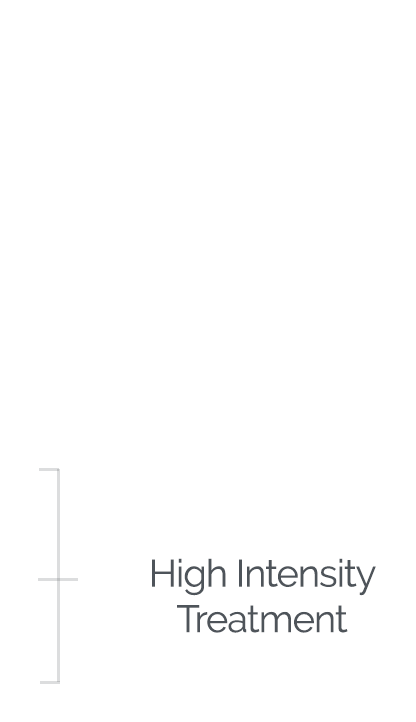 High intensity treatment (cumulative total 23.5% of all asthma patients). Difficult to treat asthma = poor asthma control + high intensity treatment (cumulative total 17.4% of all asthma patients). 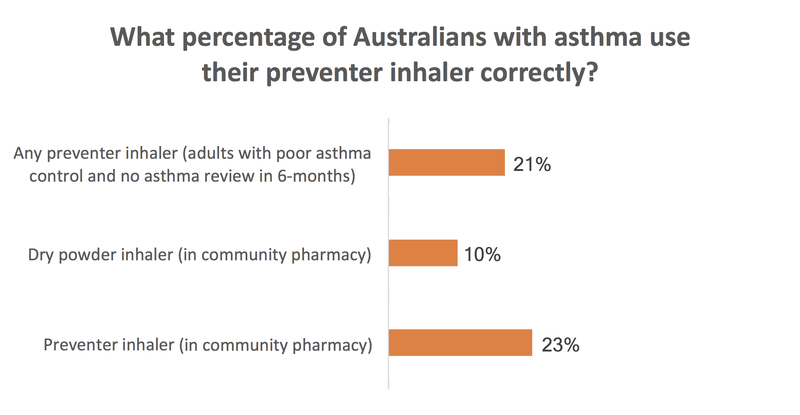 How many adult Australians with asthma have good adherence and correct inhaler technique? The Australian Asthma Handbook gives practical advice about how to check adherence and inhaler technique in patients with uncontrolled asthma. If problems like this are found, they should be corrected before stepping up treatment or assuming that the patient has severe asthma. Adults with asthma in primary care, with poor symptom control (ACT score <20) (n=67) (Foster et al. 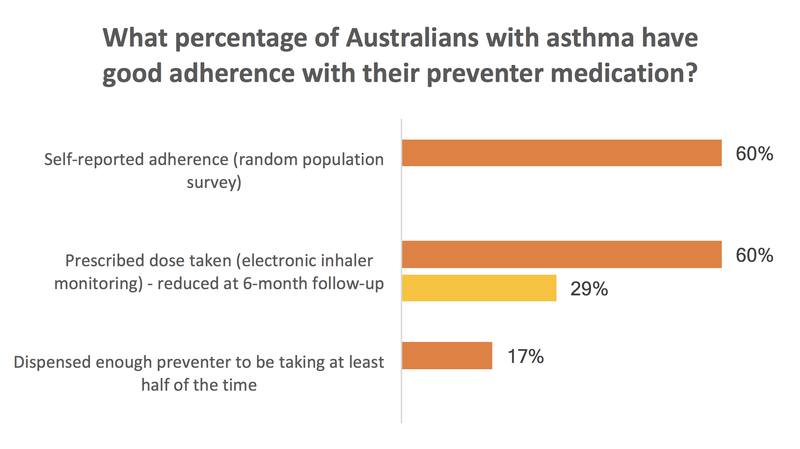 2014) Proportion of prescribed dose being taken, from electronic inhaler monitoring In the first month after seeing their GP about their asthma, patients took 60% of their prescribed dose. By 6 months, this had fallen to 29%. There have been significant advances in the management of and outcomes for people with mild to moderate asthma, but people with asthma still experience a significant burden of disease. People with asthma can die from severe asthma attacks (severe exacerbations); around 15% of asthma deaths occur in people with apparently mild asthma (Dusser et al. 2007). Asthma deaths in Australia are among the highest in the world and are rising. In 2014, asthma accounted for 419 deaths in Australia, which represents 0.3% of all deaths at a rate of 1.5 per 100,000 population (AIHW 2017 Snapshot, based on data from ACAM). Further, mortality due to asthma is higher in Indigenous vs. non-Indigenous Australians, and is higher in people living in remote areas and those living in areas with lower socioeconomic indices (ACAM 2014, AIHW 2017). Asthma accounted for >38,000 hospitalisations in 2011-12 (>81,000 patient-days) or 0.4% of all hospitalisations (Table 1.1 in (Poulos et al. 2014)). 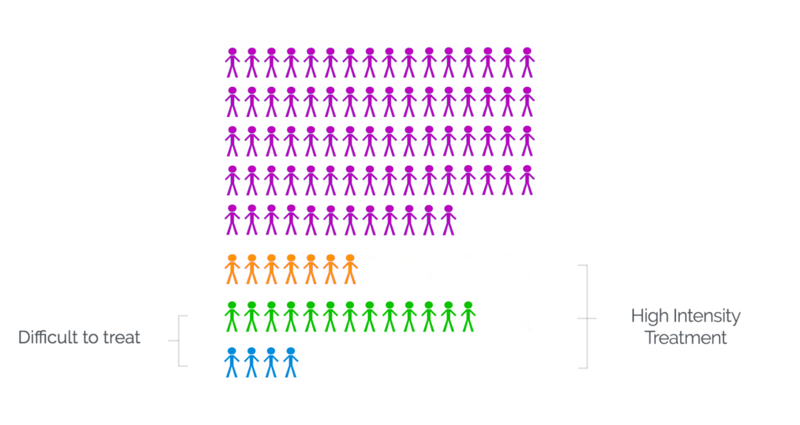 When assessed based on ‘disability adjusted life years’ (DALYs), asthma accounted for nearly 117,000 DALYs representing 2.3% of all DALYs in Australia, i.e. 2.3% of the total Australian disease burden (Table 1.3 in (Poulos et al. 2014)). DALYs take into account both years lived with a disability (YLD) and years of life lost (YLL) due to premature mortality. Because asthma often affects young people, it contributes the highest proportion of YLD of all lung diseases, representing 4.0% of YLD from all diseases (Table 1.4 in (Poulos et al. 2014)). People with asthma also experience a significant emotional and psychological burden, with a recent review finding this even among those with mild or moderate disease (Pickles et al. 2018). The costs of asthma were reported in the recent “The Hidden Cost of Asthma” report in 2015, which estimated direct costs of asthma as $1.2 billion, with total economic costs totalling $3.3 billion and total burden of disease costs of $23.7 billion (The Hidden Cost of Asthma 2015). Severe asthma is thought to account for a large proportion of healthcare expenditure for asthma, with a Canadian study estimating per patient costs for severe asthma as ten times that of mild disease and accounting for over 60% of healthcare costs due to asthma (Sadatsafavi et al. 2010). The emotional and psychological burden of severe asthma is very substantial, impacting on daily activities, career, family and friends, and with high rates of depression and anxiety (Foster et al. 2017). 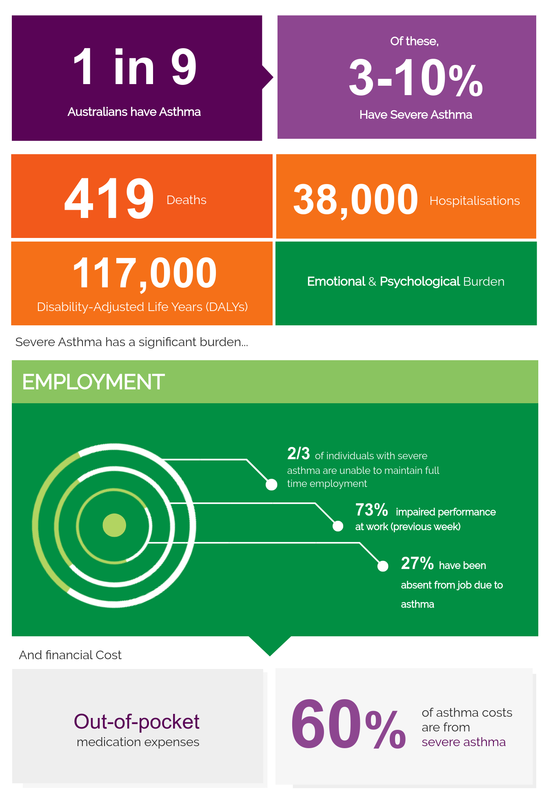 Further, in the UK, ~2/3 of individuals with severe asthma are unable to maintain full-time employment (Heaney et al. 2010). In an Australian population, 73% of individuals with severe asthma report being impaired at work due to their health in the previous week and 27% have been absent from their job due to their health (Hiles et al. 2018). It is asthma that remains uncontrolled despite treatable factors having been addressed and maximal inhaled therapy being taken regularly.